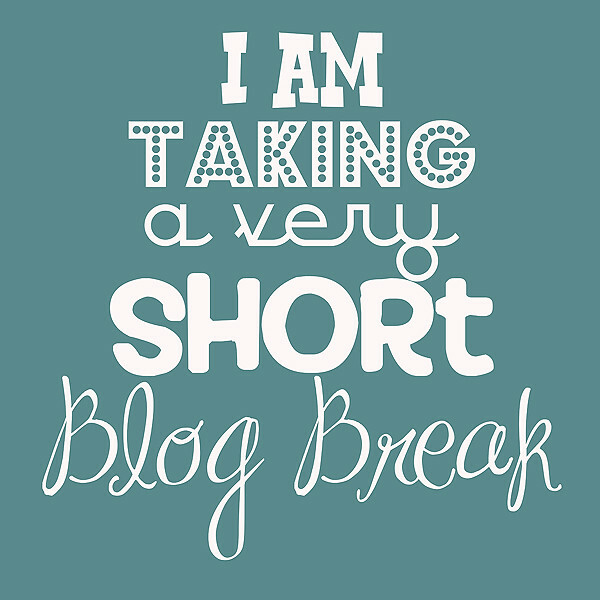 I wanted to pop in to let you know that I will be taking a little blog break. I will be back to regular postings on August 15th. 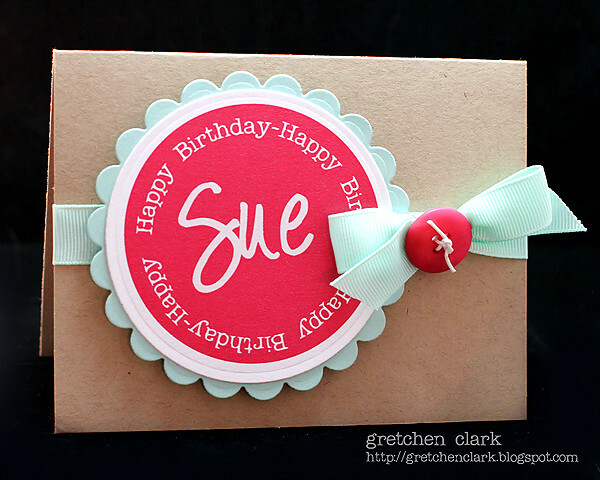 I made this card a couple of weeks ago for my BFF, Sue, who I miss soooo much!! 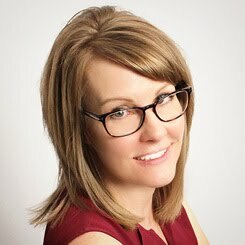 She lives in VA and I hope to take a trip to visit her for a girls weekend!! I was playing around in Adobe Illustrator (trying to learn that program), and made this personalized tag to attach to her card. I love the fact that the large image makes the card come together sooo quickly! I made a file to share that you can download HERE. All you have to do is open in it Photoshop (or any other editing program and add the name to it). Then just use the Nestabilities circle/scallop circle dies to cut out the image. I hope you had a great weekend!! Mike and I had a great (short) visit to CT last week!! It was nice to get away, but it is always nice to come home! Josh's girlfriend Jess celebrated her 20th birthday last week, but since Mike and I were leaving to go out of town, we pushed it to yesterday (since we usually celebrate birthdays on Sunday after church). 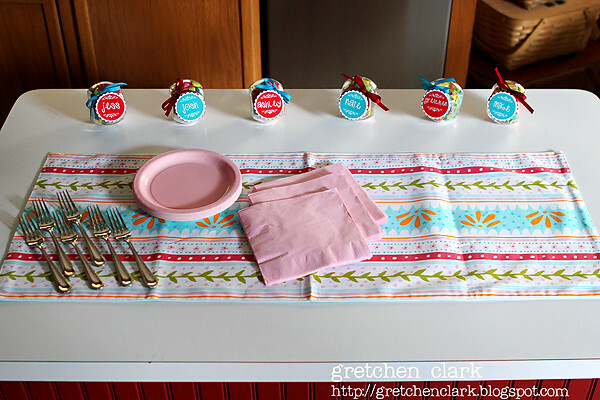 Here are the favors I whipped up for the party. 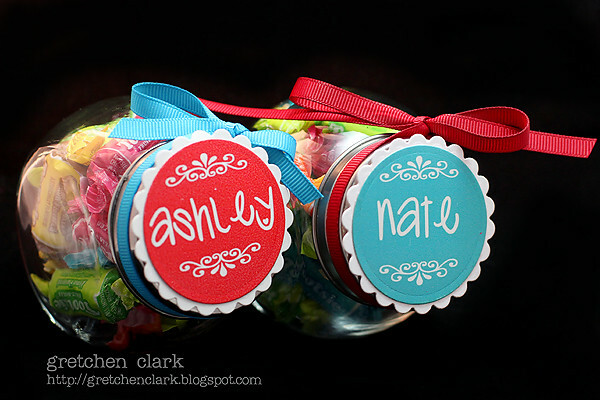 I found these jars at Hobby Lobby, and made the name tags in Adobe Illustrator, then just ran them thru my Cuttlebug with my Nestabilities circle/scallop circle dies~Easy Peasy!! They are filled with the fruity Tootsie Rolls, which my kids LOVE. Here is the card I made for Jess~this one also came together really fast! I downloaded the subway art from Eighteen 25 and just shrunk it down in photoshop to fit my rectangle Nestabilities die. You can down load the image HERE. Mike and I are taking a very short trip to Connecticut. We will be back on Wednesday (so my post will be a little late on Wed, LOL!). I whipped up this card for my brother in law last week. I made the center image in Adobe Illustrator and just jazzed it up with a few buttons. I have another quickie for you today!! 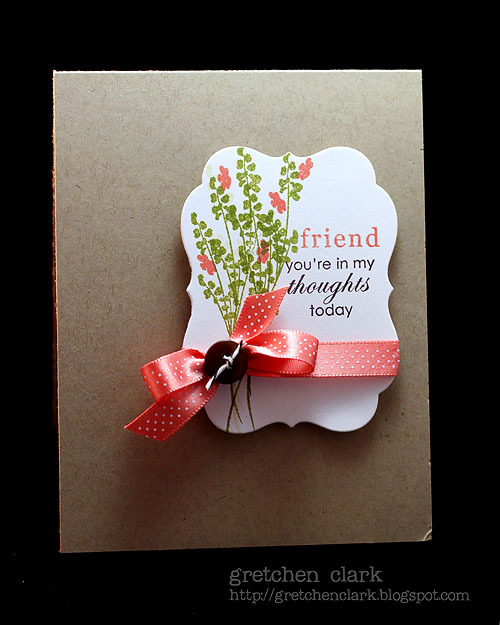 I have blogged before that Josh's girlfriend, Jess also makes cards. 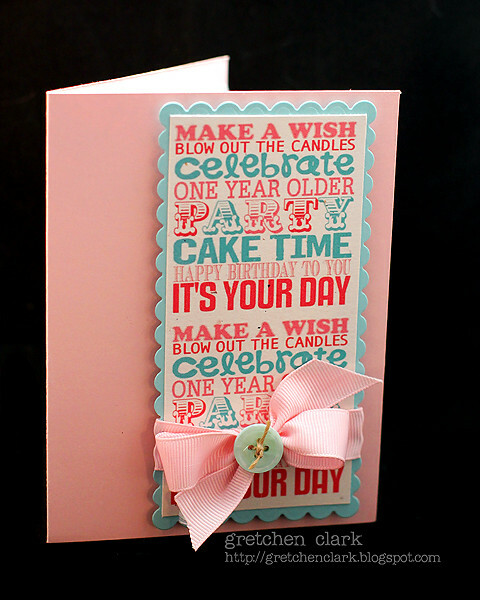 Here is the super cute card she made Ashley for her birthday *smile* That girlie is pretty talented!! 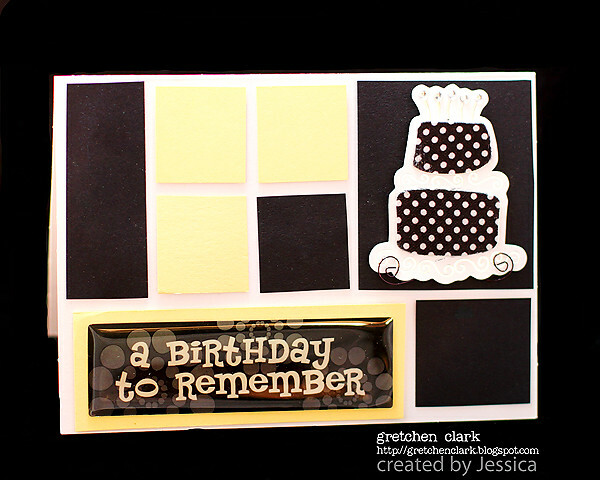 Here is a quick 4x4 card, and a quick post!! I needed a "small" card to attach to Ashley's Birthday gift for our work party celebration, so I whipped up this little number~she especially liked the gift card to HERE that was inside :). Hope you had a FABULOUS weekend, mine was a whirlwind!! We celebrated Ashley's birthday on Saturday night, you can see a couple of photos HERE. It was a lot of FUN!! I love having everyone over for yummy food, chit chat and swimming!! Yesterday I ran around returning/purchasing coffee makers, you can read about that HERE (if you want). I whipped up this quick card for Ashley on Saturday morning (nothing like waiting until the last minute, huh?). It came together VERY fast, thanks to the free printable hybrid elements from Ali Edward's blog~go HERE to download them!! 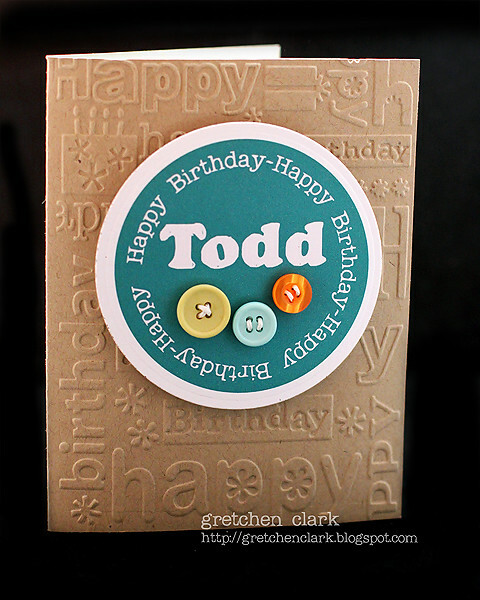 I used my Nestabilitie circle dies to cut out the image and just used a background stamp~Easy Peasy!!! Today we celebrate Ashley's birthday at work~I have been eating lots of CAKE~YUM!! Good thing Kodi make me feel guilty if I don't walk him every day, LOL!!! 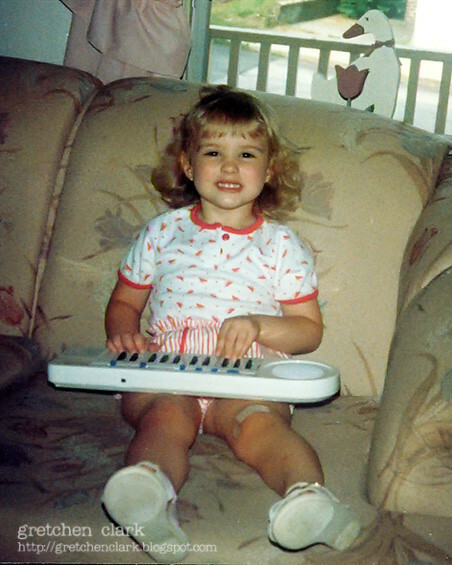 25 years ago today, this cutie (or poopy-doopy as we called her) changed our lives forever!! Happy Birthday Ashley!! I love you!! We are celebrating her quarter of a century birthday on Saturday night~I have some crafty things up my sleeve!! stay tuned!! 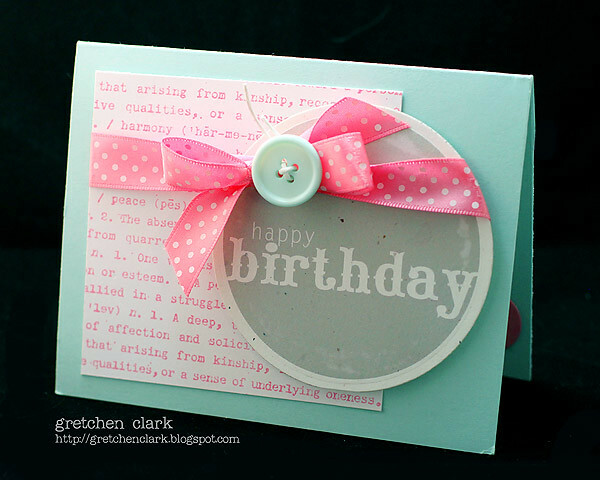 I did manage to stamp up a quick card last night~very easy peasy!!! Are you ready for a long weekend (well, all my USA peeps). I LOVE long weekends!!! Not sure what I will do with all my "weekend" time, but I hope to get some time in my craft studio :) Lots of stuff going on in my brain (which can be quite dangerous, LOL!!). I really wanted to paint my kitchen/family room this weekend, but my hubby does not share the same excitement that I do about taking on that project (I will keep working him, LOL!). Last night I had a few moments to make a card for a friend. I pulled out my Life stamp set (which needed some dusting off), I forgot how much I love the images in this set!! 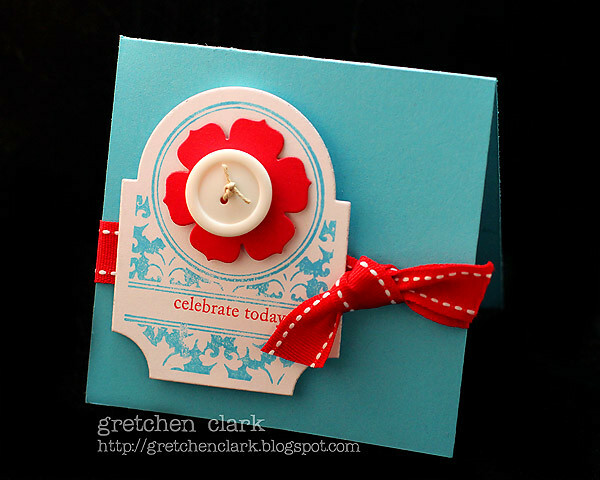 I am still on my "less is more" kick, so it is another CAS (clean and simple) card for today. Well, that is about it for the chit chat today~ta ta for now!!! Enjoy today and the weekend!! !